A year ago, the Bank of Canada (BOC) delivered the first of two rate cut surprises for the year. So with oil still cratering ever lower, I can understand why the market seemed braced for yet another rate cut last week. Instead, the BOC not only stood still on rates, but also it expressed an implied reluctance to reduce rates any further unless absolutely necessary. 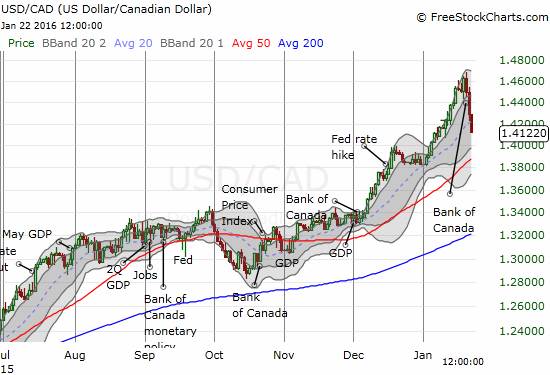 The result was an immediate jump in the Canadian dollar (FXC) featuring a drop in USD/CAD. USD/CAD continued to sell off right into the week’s close. 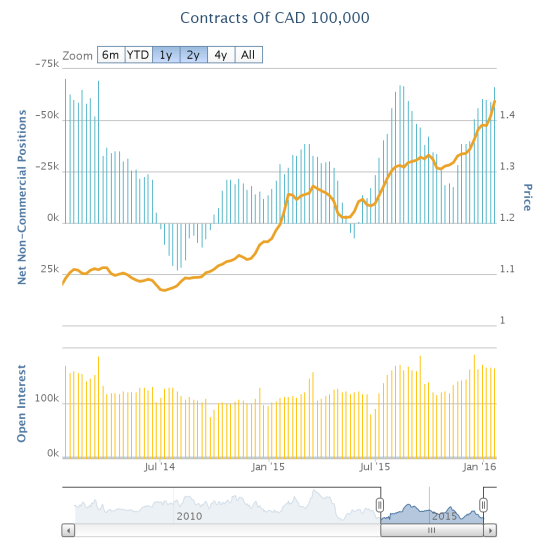 Going into the Bank of Canada January, 2016 decision on monetary policy, speculators were ramping up net short positions against the Canadian dollar. USD/CAD printed topping action just ahead of the Bank of Canada decision. The currency pair has shot nearly straight down ever since. 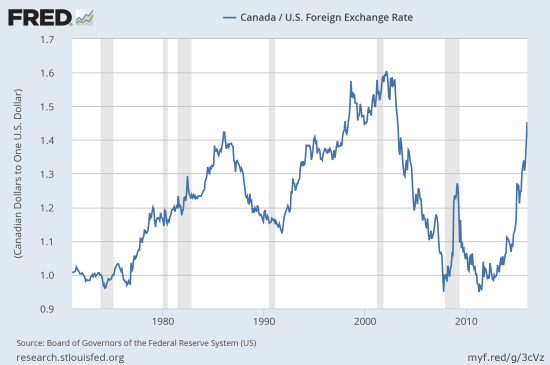 The Canadian dollar has been weaker but the PACE and extent of the weakening is nearly without recent precedent. Source: Board of Governors of the Federal Reserve System (US), Canada / U.S. Foreign Exchange Rate [DEXCAUS], retrieved from FRED, Federal Reserve Bank of St. Louis, January 23, 2016. “First, the Canadian dollar has declined significantly since October, which means that the non-resource sectors of our economy are receiving considerably more stimulus than we projected then. Let’s remember that it typically takes up to two years for the full effect of a lower dollar to be felt. In other words, financial markets have pounded the Canadian dollar so thoroughly that most of the BOC’s goals for easing have been accomplished already. The potential 2-year lag in impact means that the BOC must proceed with extreme caution when deciding to add more kindling to the raging fire of currency devaluation. Moreover, this devaluation is now exerting inflationary pressures on the Canadian economy – to the tune of an incremental 1 percentage point. While current inflation may still be within tolerance, the pace of the increase could be strong enough to send future inflation expectations soaring past the BOC’s comfort zone. Given the lagging impact of the devaluation, the BOC could find itself fighting stubbornly high inflation expectations for an uncomfortably long time. During the press conference, Poloz clarified that the BOC does not think this process is underway. The Bank is simply keeping an eye on this potential – which is clearly enough to give them caution about doing anything that further drives down the value of the Canadian dollar. As usual, the BOC is cautiously optimistic about economic prospects. Despite a disappointing 2015, the BOC still expects the global economy to resume “gradual strengthening” in 2016. Expectations incorporate an assumed transition to a 6% annual GDP growth rate for China, and continued “solid” performance from the U.S. Even with weak exports to the U.S. in the fourth quarter, the BOC expects export activity to turn right around in 2016. While downgrading its forecast for Canada’s GDP growth in 2016 to 1.4%, the BOC emphasized that year-over-year, growth should be 1.9% for the fourth quarter of this year. Even though the BOC did not cut rates in this last meeting, make no mistake about its bias. The BOC thinks it could take up to three years for the Canadian economy to fully adjust to the complex structural changes wrought by the collapse of the oil complex. The Canadian economy may not absorb excess capacity in the economy until late 2017. The BOC also acknowledged the growing magnitude of the shock from this collapse. The BOC called this reality a “significant setback compared with our October projection.” During the press conference, Poloz also admitted that the odds of a recession are higher than they have been in a very long time. All these realities imply a notable bias toward weakness for the Canadian dollar for quite some time. When I wrote about the Canadian dollar’s fresh milestone of weakness, I described a small counter-trend bet that USD/CAD would return to 1.40. As the chart above shows, the USD/CAD just continued to spring higher after the 1.40 breakout. The Bank of Canada’s stasis on rates combined with the forex response was my signal to finally add to that bet. Without a promise to cut rates again, I fully expect USD/CAD to reverse most if not all of recent gains assuming oil does not resume its rapid plunge in the interim. I will continue to try holding out for that return to 1.40, but I am perfectly fine bailing on the position if renewed strength shows up ahead of this week’s Federal Reserve’s meeting. On a technical basis, the counter-trend momentum in USD/CAD looks like it could easily retest the uptrending 50-day moving average (DMA). At the current pace, this would happen around 1.39. After I close out this short position, I will be quite eager to get back to trading with the trend. During the press conference, Poloz would not commit to a specific level past which weakness in the Canadian dollar will no longer help the Canadian economy. He would only say that the assessment depends on the nature of the decline. If the currency is declining “on its own,” then there is a problem. An adjustment from economic realities makes sense – the current decline is mostly about the collapse in the oil complex. However, trends beget trends, and I can see several scenarios of overall financial turmoil and volatility that could send USD/CAD hurtling ever higher even independent of a fresh plunge in oil prices. So, the Canadian dollar presents a precarious predicament for the Bank of Canada. Its devaluation is a necessary part of the Canadian economy’s adjustment to lower oil prices. The potential inflationary impact of this rapid decline could constrain the Bank’s ability to provide more assistance to a wobbly economy. Yet, without this assistance, the weakness of the economy could drive even more weakness in the currency. Currency traders will easily seize upon the trend above all else. In coming weeks I will be reviewing the Monetary Policy Report (MPR) and a soon-to-be-released BOC paper on the complex impact of the oil shock to find any additional (tradeable) insights.